Now that creature comforts are covered, let’s move onto the nuts and bolts of exhibiting at a convention with the least amount of stress. Preparing and setting up your display is probably the most stressful part of doing conventions. Next to actually producing whatever you’re selling, it takes up the most time and money. If you work on commissions or demo at the table, that needs to be factored into your planning as well. Problems in these areas are the quickest way to derail your convention experience, turning a fun experience into a stressful one. 3. Never let your display or working conditions depend on anything that you don’t supply or can’t manage yourself. You have to be able to adapt to changing conditions. Even without malice or incompetence on the part of the convention, conditions can change what was promised or assumed. You need to have backup plans for anything that could interfere with your business, so you don’t waste your time freaking out about something you can’t change. If you’re prepared, you can just shift to Plan B. If it all possible, do not depend on electricity at your table. It’s fun to have interactive media at your table, and some people may need electricity to run their equipment. However, we have seen enough people have trouble securing electricity, even when it’s paid for, that we would never advise a setup that requires it. Always have a backup plan. If you don’t need electricity to run important equipment, don’t design your display around it. Save media for accents, not the centerpiece of what you’re doing. If you need power and there’s no way around it, look into backups. Some things can run on batteries, and some venues may allow you to bring portable power stations along. Bring portable chargers for things like smart phones and tablets, so that you don’t lose your ability to take credit cards because your phone is dead. Nowadays, it’s just silly not to take credit and debit cards at conventions if you have a smartphone or tablet. It’s an easy way to improve your sales with very little stress or trouble for you. Since you might be separated from a source of electricity for a long time, spend five dollars and get yourself a little portable charger. There are some that are about the size of a tube of lipstick that will charge an iPhone twice, for example. You can spend a little bit more and get some that will charge a tablet. 😉 Of course, you do need to remember to charge the charger. Make sure your credit card device allows alternate means of entry. Sometimes cards just don’t swipe, or you have difficulty connecting to the network. If you can manually enter numbers, or run transactions in a batch at the end of the day if there are connection problems, you will have less trouble with sales. If you use a cash box, try to place it behind a display to make it hard to access from the front of the table. Do not design your display to require a certain table location, traffic configuration or amenity. This is one that we’ve seen literally end in tears. Do practice set ups at home, and make sure that nothing in your display needs anything supplied by the venue/event other than a stable flat surface to work. This is the ideal. You can usually count on having a table, if nothing else. We’ve had to improvise a table only once, for our first convention. 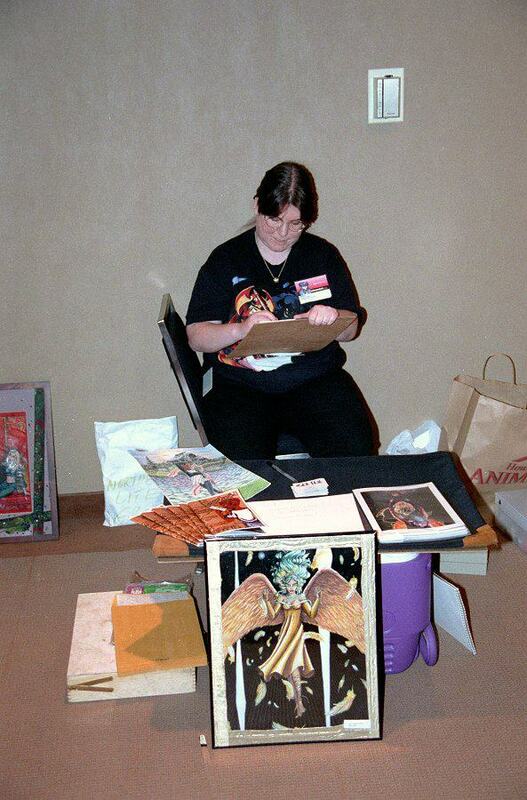 Our very first “table.” Long story, but this was sanctioned by the convention. Do not depend on having a wall at your back, a corner or end booth, or even three tables in a straight line. Your display should be able to handle people walking to either side, in front, or in back of it. You should be able to move your signage to be visible from any angle you need. If you can see through your display, consider investing in an opaque backdrop. These days many people are using signage or placing items on the back of their displays which confuses your potential customers. An opaque backdrop solves that problem and also helps cut down on visual clutter, allowing viewers to focus on your artwork. (Artist Alley has largely become the sensory equivalent of a punch to the face, you’ll stand out by default.) If you are using grid panels, consider hanging fabric behind them to achieve opacity. If your setup needs to be anchored to the table, plan for differing table sizes and widths and have a backup method ready. If you use clamps, for example, find an adjustable type that can handle tables with lips-we’ve seen these up to six inches- or have an XL backup set. If you are using tape or safety pins, what will you do if those don’t work or aren’t allowed? If you have a banner on the front of your table, consider attaching it to a runner so you do not need to secure it to the table or tablecloth. Test at home-if it’s heavy, weight the opposite hem to keep it on the table. Design your display to both expand and contract into different sizes easily. Even if the info you have received states a specific table size, things happen. Sometimes the wrong info is given out by the venue, sometimes they switch suppliers and redo their setups without giving that info to the event, etc. At con time, the staff has little to no control over this, and complaining won’t fix it-it’s not like they can purchase different tables. If you plan ahead, you can reconfigure with little trouble. For reference, the most common tables used at events range from 6-8 feet long, and 18-24 in wide. Again, sometimes these tables have a lip underneath up to about 6 in from the edge. Tape off the range of sizes on a table when you are practicing and see how you would have to change things to accommodate different dimensions. You can stack books to test clamps. You never know if the venue will supply it, and using your own allows you to customize the look to complement your products. Also, bring an extra cloth to cover your table at night. Bring your own banners and signage. Sometimes venues supply basic banners, but “Booth 61” isn’t exactly good advertising for you. Also, try to have both vertical and horizontal options available so that you can make the most of your space. Work to make your display as lightweight and compact as possible. Seek out display items that are collapsible, easy to carry, and durable. Anything you use for display should be able to be taken apart and put back together easily, without damage. Look at store supply warehouses and trade show display companies and get creative. Consider how you will transport your items, and what limits that places on size/weight. If you require tools for setup, make sure there is a way to keep your tools with your display so you don’t leave them behind. If you can buy a special set of tools for it, do so, and never separate them. It’s also a good idea to keep a sturdy multi-tool with your convention items, just in case. Your display should be able to be set up by one person in an emergency. Things happen. People get sick, held up, arrested, etc. If you can’t set up alone, one day you will be stuck at a con alone, at the mercy of anyone who happens to take pity on you. Again, practice your display at home and identify any potential problems before you get to the con. If your setup takes more than an hour, change what you’re doing. Long setup times are a luxury you can’t always count on. Venues change rules at the last minute, you have travel delays or personal issues that limit your time. If your display requires hours to set up, you will always be stressed and watching the clock during early setup times. If you have to set up right before the floor opens, you run the risk of being shoplifted or losing sales. Time yourself, figure out why you are taking so long and come up with alternate solutions. If you require shelves, for example, don’t use something you have to screw together. Make or buy something that slots together instead. If you spend hours taping prints together to hang, get plastic sleeves that you can fasten together and hang with clips or rings instead, and roll or fold them together, pre-filled. Get your stock and display organized in advance. Pack items in reverse order of display. The last item to go into a box should be the first item you are placing in your display. For example, your tablecloth should be on top, so it gets placed first, and you don’t have to move anything to put it on the table. This avoids reshuffling during setup. 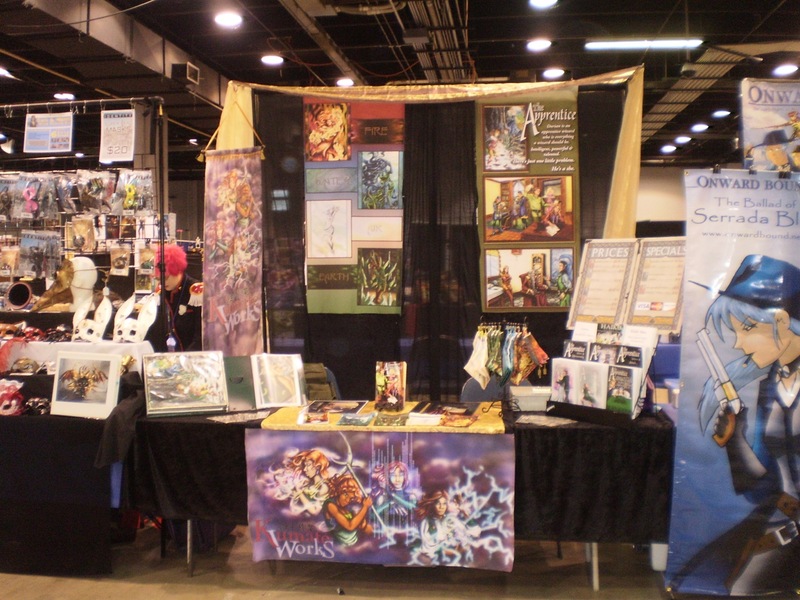 If you have to drive into a convention to bring in your display and stock, consider getting a vendor booth instead. Vendors usually get more privileges than artists in terms of load-in and setup times, and the higher fees get you a bit more clout. If you truly need and can afford an elaborate setup, a vendor booth may be the best choice for you. If you will be making art at the table, consider purchasing a small battery-powered LED light. Especially in hotel settings, light is often suboptimal, and generally out of the event’s control. (They might have toured during the summer when ambient light is brighter, for example, or have never been in the area at night.) LED lights are very efficient and compact, and with a small investment in rechargable batteries you can have controllable light all weekend. Make a toolkit especially for conventions, and minimize the size/weight. Look for compact and portable versions of your working tools, and dedicate a box or bag to them. Keep them there if at all possible-you’re less likely to leave them behind that way. Plan your display around your workspace. People like to watch artists at work, and if you are shy, this can help you start conversations with potential customers. Make sure you have adequate room, and that attendees can see what you are doing. Arrange your displays so that you have access to your supplies while not blocking off your products. Plan how you will handle money and sales while you are working. You cannot always be certain someone will be there to help (customers seem to have radar for when your buddy is on a break), so make sure you can handle money and packing up purchases without putting away your work. Try to have a backstage area at your booth-somewhere to keep anything that shouldn’t be out in front of other people, like food, dangerous tools or money. This keeps you from juggling while you are working. If you generate trash while working, consider picking up a mini trash bin to keep at the table. One or two trash runs during the day is a lot less troublesome than constantly running back and forth. It’s easy to lose track of plastic bags, and having garbage on the table is off-putting to customers. You can also pack items in the trash bin, allowing two uses for the same item. So there you have it. Stay flexible and plan ahead for problems and you can have a calm setup to start your event off on the right foot.